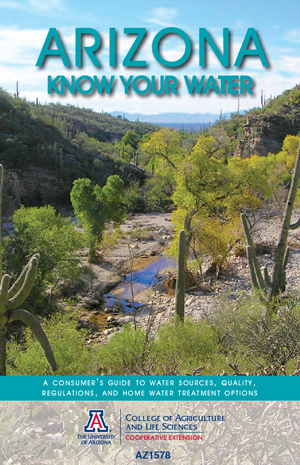 A consumer's guide to water sources in Arizona, quality regulations, and home water treatment options, funded through the TRIF Water Sustainability Program grants program has been reprinted due to popular demand and is now available. This convenient spiral bound volume covers water use and water sources in Arizona, minerals and contaminants in water, water quality regulations and standards, and home water treatment options. Each option is fully described, including operation and maintenance tips. Copies of the booklet are available at the University of Arizona, Water Resources Research Center, 350 N. Campbell Ave, Tucson AZ; by phone, FAX or mail order (call 520-621-9591 for information); and can also be ordered on-line at CALSmart for $5.50 including shipping and handling. Bulk discounts are available.